Offering you a complete choice of products which include timing pulley, aluminium timing pulley, taper lock timing pulley, large diameter timing pulley, timing pulley with taper lock bush and customized timing pulley. (31.75),2M,3M,5M,5M STD,8M,8M STD,14M,14M STD,20M,T2.5,T5,T10,T20as per Standard or as per DrawingWith and Without Taper Lock Bush. 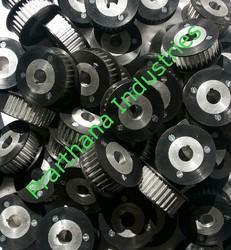 We are an acclaimed name engaged in offering our precious clients a superior quality range of Aluminum Timing Pulley. 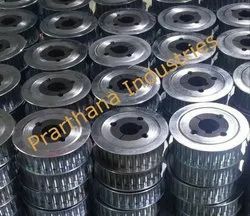 Our offered timing pulley is developed by using finest quality material and advanced technology in compliance with the set norms of industry. 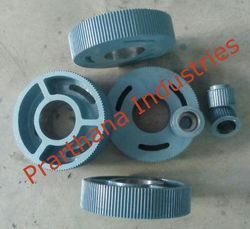 The offered timing pulley is obtainable in various specifications for our customers to choose form. In addition, the offered timing pulley is tested on several stages by our quality controllers for assuring its excellence. Being a reputed organization in the industry, we are offering Timing Pulley. 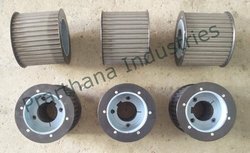 These timing pulleys are acknowledged among customers due to their optimum quality & easy installation. Offered timing pulleys are designed utilizing finest grade material & modern techniques under the guidance of professionals. We stringently check these timing pulleys on several parameters to ensure its excellence at users' end. Made from CI, MS, En and Aluminium Material with our without Flanges, with or without Taper Lock Bushes. With and Without Taper Lock Bush. 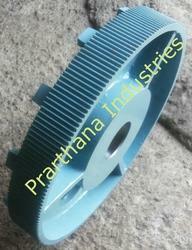 We are the leading supplier of Timing Pulley as per Drawing made available to our clients at competitive prices. Timing Pulley with Taper Lock Bushas Per Drawing or Technical Specificationsin all Pitches. Looking for Timing Pulley ?